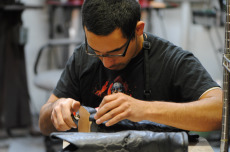 Quite simply, our goal is to 'wow' you with over-and-above service and exceptional craftsmanship. Each member of our team works with one goal in mind: to make your day! When you walk through our doors, you'll may be welcomed at the counter by John, part-owner and one of our cobblers. 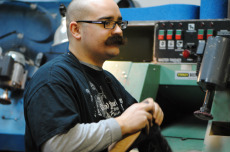 He'll greet you with a smile and a wealth of knowledge from our cobbler team. If John is already serving a customer, you may be greeted by Janet. Chances are she will offer you a cup of coffee, and invite you to have a seat in our reading area while we take care of your needs. You can sit and listen to music from the 40's & 50's, The Crooners, Louie Armstrong and many more on our Wurlizter Jukebox. Peek in the back of the shop, and you'll find Ace, our master cobbler at work on projects ranging from sole/heel replacement to hockey equipment to leather repair. He may have tools in hand, but always has a moment to answer your questions or give a friendly wave. 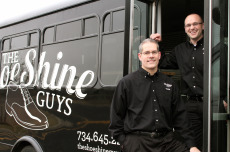 Drive around metro Detroit for very long, and you're bound to see a truck from our sister company, The Shoe Shine Guys. John & Bob spend their days on the road, providing mobile shoe shine and repair services to offices throughout southeast Michigan.